This is just one of a multitude of sceanarios you could face in Danger the Game, which is by designer Philip Blackwell and published by Origami Whale This party game allows players a chance to create their own tales of adventurous escapes with the help of a special skill and a tool, while sometimes dealing with the dreaded plot twist. 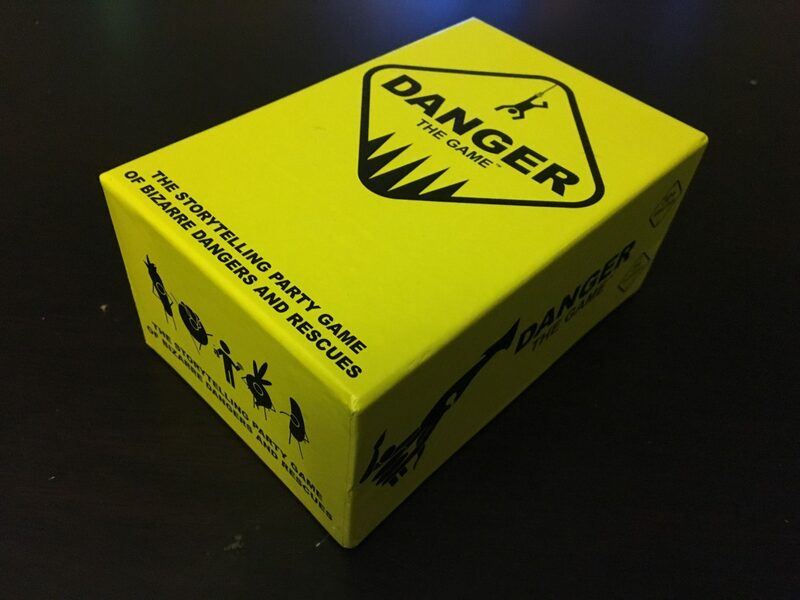 Danger follows a similar format as other party games such as Cards Against Humanity and Joking Hazard. 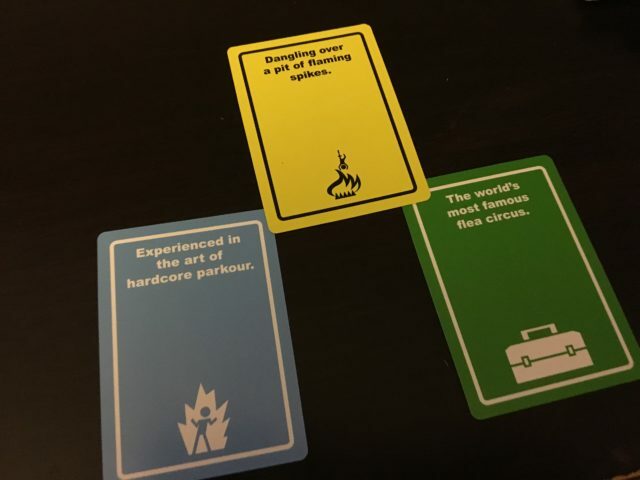 One reader picks a card, in this case it’s a danger card, the other players play card(s) from their hand in response to the reader’s card, and the reader selects the one response they like best. 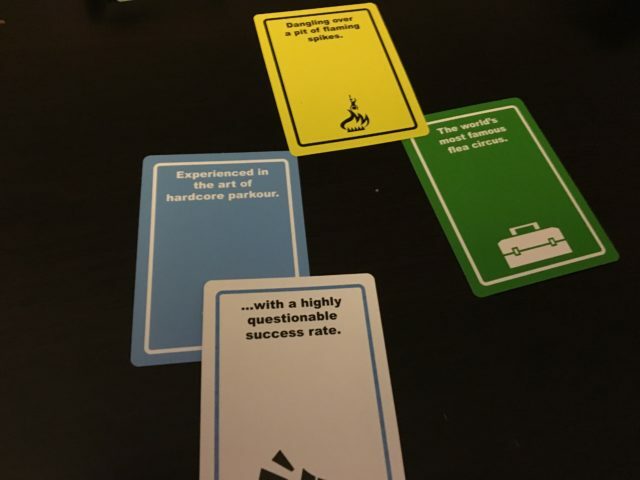 While other party games of this ilk can result in some big laughs from silly cards provided by the games designers, in Danger the winner won’t be the person who drew and played the best card, rather who came up with the best story. Danger lets players use their imagination and creativity to craft something unique, rather than rely on the wittiness of someone else’s design. 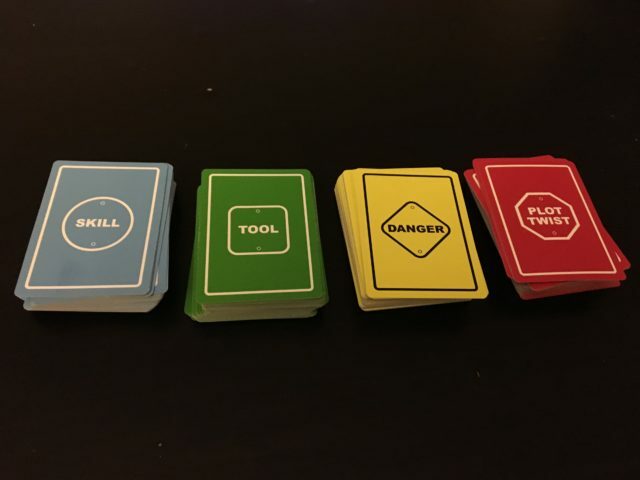 Each player will have a hand of three skill and three tool cards. 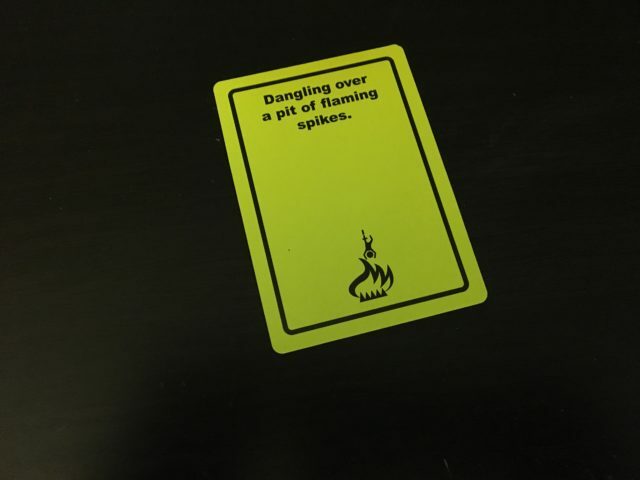 One player, the reader, draws a danger card, some will be reminiscent of an action movie scene, others offer a sillier “danger” such as stuck in the friendzone. The players use one skill card and one tool card to craft a story, and as to what that can be is only limited by your game group’s imagination. The game also includes plot twist cards, which players can use on someone else’s turn to try and throw them for a loop. The instructions refer to this as a variant to the base rules, but I would say they should always be used. The plot twists are great and I found playing they can often help the other players, as it can refocus them or give them another idea to bring depth to their story. As with any party game, a successful evening will depend on people buying into the concept. 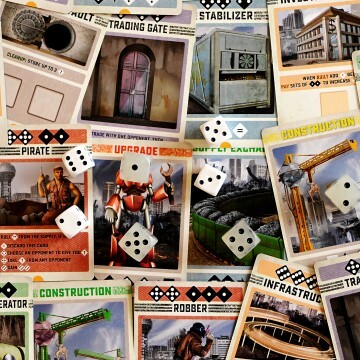 In the case of Danger, buying in might seem as a more daunting task than other party games that just require you to play a card with no explanation. That was my concern before I gave Danger a whirl. I found that when given the chance to craft their own tale, people leapt at the opportunity and marveled at the different ways each person would approach the game danger card in front of them. Some stories feature heroic deeds or tales of romance, others delve into melancholic woe or metaphysical wonderment. By the end it didn’t really matter who “won,” as even the stories that went off-track left everyone in hysterics. Perhaps the best thing about Danger the Game versus playing other similar party games is that the complaints about having “crappy cards” isn’t realty an issue with Danger. Sure, there are times when someone might have cards that better suit a danger at hand, but that doesn’t mean they will craft the best story. With enough imagination and moxie players could use any card to build their own story that will wow the crowd. If anything, using weird, unrelated cards to the danger just gives a player more license for creativity. I think with experienced Danger gamers, I’d like to try a variant where one random tool and one random skill are flipped up in front of a player, forcing them to come up on the push their creative muscles to the limit. The component quality of Danger the Game is solid. It comes with plenty of cards, including several blank ones that people can fill in with their own skills, tools, plot twists and dangers. The game comes in a small enough box that bringing it over to your friend’s house for game night isn’t a burden. There is a recent Kickstarter out by the people from The Dragon’s Tomb called Offensive Adult Party Game. Danger the Game is the perfect antidote to that genre of game. 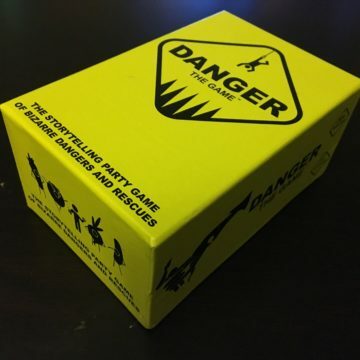 Danger the Game is a storytelling party card game for 3 to 8 players that plays in 30-plus minutes. Designed by Phillip Blackwell, co-designed by Tyler Burgett, Andrew Dean, Daniel Kim and Eric Scherper with art by Walter B. Jones, it is published by Origami Whale. We thank them for a review copy of the game. 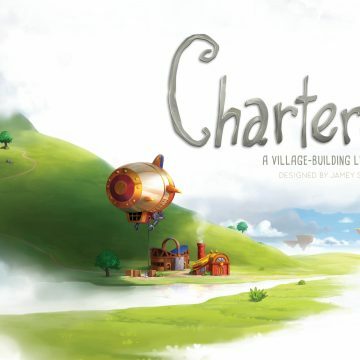 We’re taking part in the Charterstone Early Bundle Charity Auction!